— lyric from "Journey Into Fear. The appeal of stories about tragic young princesses like Anastasia Romanov, the youngest daughter of the last Russian Trsar, tend to live on.. . .even nowadays when it's been proven beyond a doubt that was assasinated along with her family. (The Romanov graves were found, excavated and bodies of the entire family accounted for and identified with DNA tests). The is-she/isn't-she alive rumors are of course a natural inspiraton for writers. One of the first to dramatize the story was French playwright Marcelle Maurette, whose reputation was built on romantic tragedies about real or historical heroines. Her Anastasia, opened at Broadway's Lyceum Theater on December 29, 1954 for 272 performances. Two years later Twentieth Century Fox turned it into a film that won an Oscar for Ingrid Bergman. In 1997 Fox's Animation Sudios produced a crowd pleasing animated musical film with music by Stephen Flaherty an Lyrics Lynn Ahrens that produced two Academy Award and Golden Globe nominated hits, "Journey to the Past and "Once Upon a December." With the success of family fare like Matilda and Wicked, the folks at Twentieth Century Fox certainly can't be blamed for thinking that the time was ripe to run this legendary fairy tale into a big Broadway show. An so, here it is, with new songs by Ahrens an Flaherty added to the favorites from the movie, a new book by their Ragtime collaborator Terrence McNally And Ahrens' and Flaherty, and Darko Tresnjak the inventive director of Gentleman's Guide to Love and Murder on board to help audiences buy into this fairy tale, at least for a few hours. Ater testing the waters at Hartford Stage, this musicalized Anastasia, now has the Romanov's waltzing in a grand palace designed by Alexander Dodge at the Broadhurst Theatre where lots of tweens and teens and even younger kids seem to be fully caught up in it. Mr. McNally has cooked up a script that brings to mind those little bit of everything soups popular on Chinese Restaurnt menus: There's little bit of My Fair Lady, with the flower girl of that classic now a street cleaner named Anya coached by two con artists in fooling the exiled Dowager Empress into believieving that she's her granddaughter. There's also a little bit of Les Miserables, courtesy of a Russian Javert determined to catch any royal survivors— but in the spirit of feel-good Disney stories, falls in love with his intended victim. Since the libretto spans the period from the 1907 beginning of the revolution through the jazz age, the producers are obviously hoping to attract not just little girls who love princess stories but older school groups for whom this will be a combination theatrical outing and classroom history lesson. (A hope clearly being realized, if the balcony filled with several cheering groups at the matinee I attended is any indication). The show moves through the beginning of the Revolution to the grim years of communists' takeover of imperial Russia, to impoverished and also amnesiac Anya's training by the Henry Higgins style imposters, her triumphant (and possibly real) regal metamorphosis, to the final test of the is-she/isn't-she in Paris. It's all neatly book-ended by the opening scene in which the doomed six-year-old omnisciently begs her beloved grandmother, the Dowager Empress, who's leaving for Paris to take her along and their reunion — a reunion which, in a shameless nod to feel good Disneyism sees Anastasia headed into the sunset with her true love (Oh, I should have mentioned that Mr. McNally's succumbing to trite Disneyish plotting has Anya and the younger con artist fall in love). If think all this sounds more calculated for a long multiple ticket selling life than genuinely heart-touching, you're right. In fairness to this production, Christy Altomare is a fine Anya. Though she lacks real superstar charisma, she has a lovely soprano and her Act One "Journey to the Past" earns its applause. Altomare's silky soprano is matched by Derek Klena's Dimitry, the love of the two con-artists who is also the love interest. John Bolton's Vlad adds a nice comic touch to the con-game partnership. 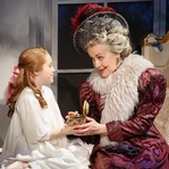 Mary Beth Peil is as usual outstanding, as the reclusive, depressed and ultimately, wise, Empress. For reall charisma in this show, there's Ramin Karimloo, who was so terrific as the good guy in the 2014 revival of Les Miserables , and here stands out as Gleb, the son of one of the Romanovs' executioners and the villain and sort-of romantic interest. Peggy Hickey's stately choreography bursts into life in a second act scene in a jazzy club patronized by White Russian expats, that brings on Caroline O'Connor,as the Empress's lady in waiting Countess Lily, an unlikely but fun character. That scene with the O'Connor and Bolton "The Countess and the Common Man" number is enough fun to almost forgive that it seems to belong in another show. Another scene. But melodramatic as it is, the one sequence that rises above Anastasia's cartoonish roots, is a stunning second act scene in which a rousing and gorgeously danced Swan Lake is accompanied by reflective solos by the four main players seated in boxes at either side of that stage within the stage. Ultimately the most successful aspect of this production come from the knockout production values, especially Alexander Dodge's scenic design and Aaron Rhyne's superb video and projections with their opulent visions of St. Petersburg and Paris that include Anastasia, Dimitry an Vlad's dazzlingly realistic train journey to Paris. But while I love the way sophisticated stagecraft can enhance a show, scenery is intended to support the story and performers, rather than be the scene-stealing star. Of course, as Wicked has proved critic proof, so Anastasia's future may well rely on validating a lyric from another musical — "Thank heaven for little girls!"